When there is an unprecedented craze among regional cinema actors to make a mark in Bollywood, Telugu Superstar Ravi Teja, has declined a film opposite Star of Millennium Amitabh Bachchan! It may come as a stunner because working opposite Amitabh Bachchan is every actor’s dream. 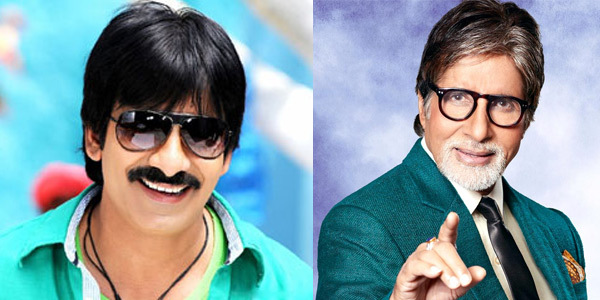 Hence Ravi Teja’s decision to turn down film offer opposite Amitabh Bachchan may be termed by many as simply ‘ridiculous’. Some may even term it as Ravi Teja’s arrogance but Ravi Teja explains the real reason. He says, “Yes, it’s true I have been offered a film opposite Amitji (Amitabh Bachchan) but I declined the offer because frankly speaking till date not a single South Indian star has been able to make his presence felt in Bollywood. So why should I make a fun of myself when I'm doing so well for myself in Andhra?" “Further I have observed that unlike Telugu films that are completed quickly, Bollywood films, take lot of time to wrap up. Hence for a busy actor like me hanging up in a Bollywood project will be troublesome for me,” he argues. “However I'm open to doing multi-starrers in Hindi. I don't mind sharing screen space with some top star in Bollywood,” he quips. It may be noted that Ravi Teja, who is on cloud nine thanks to the stupendous success of his latest film KICK 2 recently rubbed shoulders with Bollywood mega star Salman Khan, who played the lead in the Hindi remake of Ravi Teja’s KICK. The duo met at Telugu superstar Chiranjeevi's 60th birthday bash and shared a healthy relation.